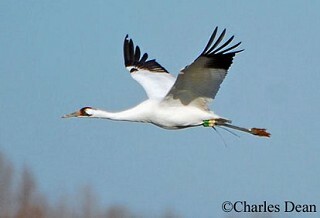 The Whooping Crane is a federally endangered species that is returning from the brink of extinction. In 1941 only 16 individuals were known to exist, but as the result of massive conservation efforts, there are currently over 500 Whooping Cranes. As of the fall of 2008, there were 387 birds in the wild and 152 in captive breeding programs. The largest wild population nests in Wood Buffalo National Park in the Northwest Territories, Canada and winters in Aransas National Wildlife Refuge in Texas. For Tennesseans the most exciting recovery effort is the attempt to re-establishment a migratory flock in a part of the Whooping Crane's historical breeding range. Beginning in 1999 captive raised young from Necedah National Wildlife Refuge in central Wisconsin were conditioned to follow an ultralight aircraft. The aircraft guides them on their first migration south to Chassahowitzka National Wildlife Refuge in Florida. The route takes the birds over East Tennessee where they stop and rest before continuing on their journey. Once they reach Florida, the birds are then on their own. These cranes have independantly returned to Wisconsin and migrated back to Florida successfully the next winter. There are now approximately 80 birds in this experimental flock. A few of them have come to Tennessee to spend the winter. In the winter of 2007-2008 and 2008-2009 one pair spent the winter in a rural area on the Cumberland River within the city limits of Nashville. See the links below for more detailed information. Description: The Whooping Crane is the tallest bird in North America. It has a long neck and long legs and a white body with a tuft of feathers on the rump. The wing-tips are black and the top of the head and cheek are covered by red skin. The bill is long and straight. First-year birds are largely cinnamon-toned with some white, and lack the red on head and face. Males and females look alike with the male somewhat larger. Cranes fly with their legs and necks extended. Sandhill Cranes, the only other North American crane, are overall gray or gray with some rust-color on the plumage, never white. The red is restricted to the top of the head and forehead. Immature Sandhill Cranes may be confused with Whooping Cranes, but are generally gray below while immature Whoopers usually have some white. Whooping Cranes are often found in the same fields with Sandhill Cranes. American White Pelicans have a massive head, short legs, and fly with their necks curved against their bodies. White Pelicans are rarely seen away from water. Snow Geese are overall much smaller, with a shorter neck, bill, and legs. Some herons and egrets in Tennessee are white, but are all much smaller, with completely white wings, and fly with their necks curved against their bodies. Habitat: Breeds in freshwater marshes and prairies. Uses grain fields, shallow lakes and lagoons, and saltwater marshes on migration and in winter. Diet: Wide variety of plant and animal matter, including mollusks, crustaceans, insects, fish, frogs, and waste grain. 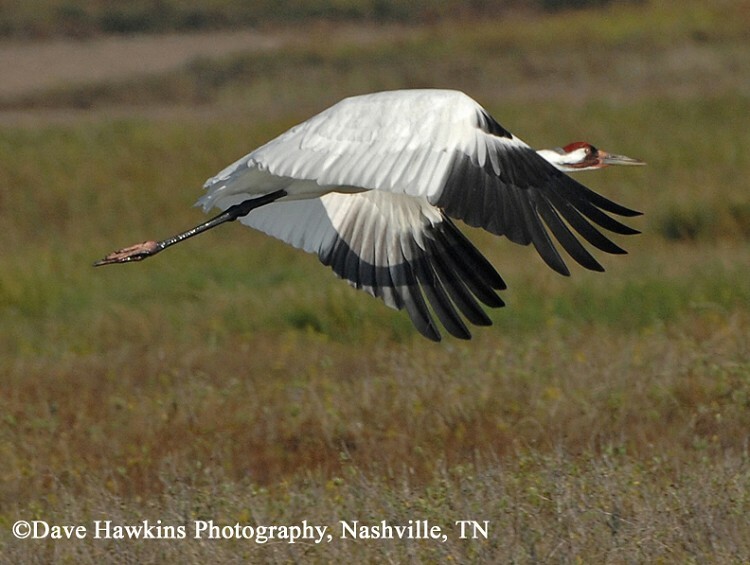 Nesting and reproduction: The Whooping Crane has never been known to nest in Tennessee. Status in Tennessee: Very rare migrant and winter resident in Middle and East Tennessee (see above for more information). Pairs form when the young birds are 2 to 3 years old. They usually attempt their first nesting at age 4. The pair will stay together year round, and their young will migrate south with them after the breeding season. The oldest known wild Whooping Crane was 28 years 4 months old. In captivity cranes live 35 to 40 years. In 1995 one captive 31-year-old male was still successfully breeding. Best places to see in Tennessee: This bird is so rare in the state that the only predictable place to look for them is Hiwassee Refuge. Lewis, J. C. 1995. Whooping Crane (Grus americana). The Birds of North America, No. 153 (A. Poole and F. Gill, Eds.). Philadelphia: The Academy of Natural Sciences; Washington, D.C.: The American Ornithologists' Union.